Chicken do you think that it’s going to take weeks to build a chicken coop? If so, you may want to think again. With the right techniques and tips you can easily accomplish this goal in as little as a few short days and have great success while doing so. 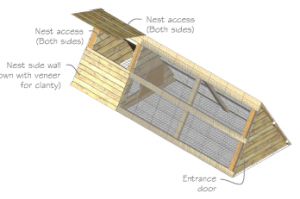 Here is what you need to know in order to build a chicken coop properly. 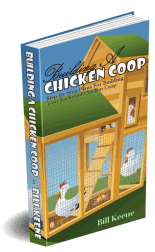 The first thing you must do as you build a chicken coop is take the time to plan the entire coop before you build. Many people make the mistake of building too early and then find out they have built too small because of all the additional pieces that have to go inside. Remember that the measurements that you get in terms of total free space are just that – free space. If you start adding the feeders, the waterers, the perches, and so on, this will take away from the total amount of free space you have, making your chickens feel more crowded. To solve this problem, draw a blueprint of your chicken house first and then proceed to build a chicken coop according to that design. Next, you also need to make sure that you’re giving your chicken coop and your chickens enough total light. This is accomplished by being sure you add enough windows throughout the coop which will serve to allow the sun to shin in. Just be sure with these windows that you are not placing them too low or the sun may shine directly at the chickens, which can make them feel uncomfortable. Locate the main direction the sun typically hits your chicken coop and be sure to focus your windows on that side of the coop. Finally, as noted in the first point, size is one of the biggest things you must take into consider as you build a chicken house. If you aren’t sure how many chickens you plan to keep, it’s a smart move to build slightly larger than you think you’ll need, then if you do decide to add one or two more, you will have enough room. The worst situation is when a chicken farmer builds the perfect size coop but then finds out he needs more chickens. Then you have to tare down the coop and rebuild parts of it or else add an extension onto the coop that’s in place. So be sure you’re following these three tips as you build a chicken house. The process may seem quite intricate but by using a building plan that breaks it down into manageable steps, it really becomes something that you can easily handle over the course of a weekend. There are a wide variety of chicken house plans available right now that you may feel overwhelmed in choosing which one will be most appropriate for you. This isn’t surprising because of the fact that most people don’t understand the process of building a chicken coop, therefore to them all the hen house plans may even look the same. They are not the same however and if you’re not choosing the correct chicken house plan, the chances that you have success with the building process will be much lower. Here is what you need to know in order to choose the correct chicken house plan for you. The first thing you’ll want to think about is the total number of chickens you plan to keep in your chicken coop. The hen house plans you’re looking at should differentiate between small, medium, and large sized plans. Matching the correct size to the total number of chickens you want to keep will help make sure they’re happy in their surroundings are will be laying eggs properly. If you’re not sure exactly how big you should be building, always go larger than you think you’ll need. Next, also consider the type of land that you have available to you. Are you going to have to landscape? If so, you’ll want to make sure you’re looking for hen house plans that give information on proper landscaping techniques so you can do this correctly. Also think about how firm the ground is. If it’s not very firm at all, you will likely want to consider a more solid base structure on top of the land to prevent the walls from shifting over time. The third factor to think about before you dive right into the building process is the climate you are located in. If you’re getting a wide variety of weather patterns, you’re going to want to think a great deal harder about the amount and type of insulation you use in your chicken coop. It’s important that the hen house plans you’re looking at identify methods that you can use to help maintain proper temperature over time because if it’s either too hot or too cold in the house there is a very high chance that you’re going to run into some problems. Finally, consider whether or not you want to build a mobile chicken coop. These are increasingly popular among many people, especially those who also want to keep their chickens as pets as well. There are many advantages to a mobile chicken coop so it is something you should give some consideration at least. By taking some time to look through various hen house plans you can take a big step towards making sure you’re choosing one that best matches your own individual needs. If you’re only planning on keeping one or two chickens total, you might want to build a chicken hutch rather than building an entire chicken coop, since this will get the job done and be a much cheaper and less time consuming option. Some people will also consider building a hutch to place in their coop, so that’s something to think about as well. If you choose to build a chicken hutch you’ll find that it’s much easier to take care of and that you’re able to find a good location in your yard for it very easily. For those who are also just getting started with raising chickens, this is usually the perfect option to choose. Here is what you need to know if you want to build a chicken hutch. Since you need to give your chickens easy access inside and out of the hutch, it’s important that you make sure you’re building a good sized door. Don’t make the mistake of building only a tiny door that the chickens struggle to get in and out. You’re better off creating a larger door and then attaching a wooden door flap that they can get in and out of. This will help to keep them protected from predators still but allow for easier access of the chicken. Second you also want to ensure that you’re raising the hutch off the ground. While chicken coops are built right on the ground, if you choose to build a chicken hutch you need to raise it off. Usually you want it raised somewhere around a foot off the ground, but don’t be overly concerned if it isn’t exactly this measurement. As long as it’s not placed right on the floor and your chickens can access it with a ramp if it is higher, that shouldn’t be a problem at all. Finally, the last thing you must be doing is making sure that you can easily open the lid of the chicken house to give you easy access to the chickens if you need it and also for cleaning purposes. Since it is a much smaller place where your chickens are going to stay, if you aren’t cleaning it regularly you are going to run into problems with how it looks overall, so taking the time to clean it weekly is a very smart move. If it’s harder for you to actually access the inside of the chicken hutch though, the chances that you do decide to clean it regularly will be a great deal lower. So be sure you’re keeping all of these points in mind as you decide to build a chicken hutch. By taking the correct action steps and having a good plan to follow throughout the building program of your chicken house.